Updated version of paper delivered at AusWeb04. 4.4 Hire a Builder or DIY? 6.1 When is it going to be open for business? This paper describes the development of the software to support ARROW - Australian Research Repositories Online to the World (a DEST-funded project under the Research Information Infrastructure Framework for Australian Higher Education). One way of conceptualising this process is to think of it as analogous to the process of building a house. The paper therefore begins by describing the vacant lot - the context in which the project came about. It then moves on to the design brief for the architect - the list of requirements. Next comes the resulting architectural drawings - the broad model and list of functions. In order to turn a blueprint into reality, one needs building materials - in this case the pieces of software required. Finally the paper discusses the state of the building site, and when the 'house' might be open to its first visitors. This is a story about building an institutional research repository. More specifically, it is about designing the architecture and choosing the building materials to make this building possible. But before the architecture can be designed, the right environment needs to exist. What was the vacant lot that made it possible for this building to even be thought about as a possibility? In this case the vacant lot had two components: a general one and a more specifically Australian one. There is a growing interest among academic institutions in collecting, preserving, reusing and creating value-added services from digital content produced in and for research, teaching and learning. The emphasis on research outputs and collaboration, and distance, flexible and online learning, together with developments in information technology, has led to an increased awareness that the digital content being created by members of the academic community is an institutional asset. This content is also increasingly being recognised as an institutional challenge, requiring both tactical management and a strategic response. At the same time many academic libraries are responding to the challenges of new technologies by taking the opportunity to redefine their fundamental role in the creation, distribution and provision of access to information. Over the past decade libraries have moved almost completely towards a digital platform for management of the information (both print and electronic) that they acquire or subscribe to. They have built significant digital collections of material published by others, and they are increasingly producing new content themselves [Harboe-Ree et. al. (2004)]. Often this content originates from, or is the intellectual property of, their own institutions. Meanwhile, all around the world, universities, their libraries, faculties, research centres and information technology and course development units, are trying to cope with the digital revolution. There is a growing recognition and articulation of the convergence that is occurring among the various digital initiatives in which universities are engaged, and the opportunities for potential synergies and more significant outcomes through collaboration and interoperability. As one example, the COLIS (the Collaborative Online Learning and Information Services model [HREF3]) work at Macquarie University has focused on testing the feasibility of interoperable standards as a way of managing interactions between a range of electronic services. 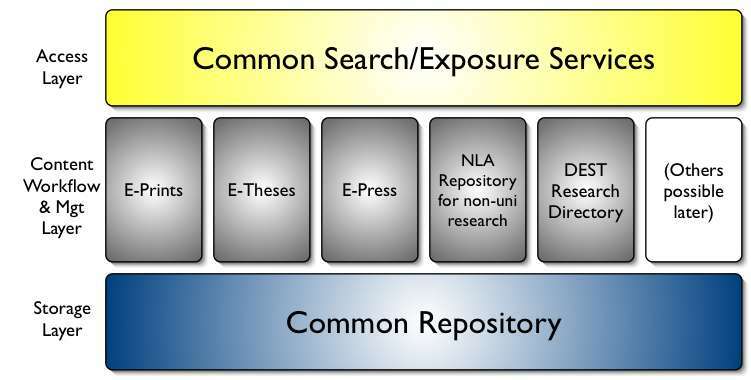 Through the success of the COLIS model, McLean and others have demonstrated that the new electronic environment can and must comprise a complex interactive matrix that is dependent on the information resources mentioned above, as well as on user directories, content and rights management software, and metadata repositories. Sally A Rogers, from Ohio State University, has argued that the full array of a university's digital assets and information services should be broadly defined, and should include the library's catalogue, the electronic journals, reference databases and other electronic resources available through the library, as well as institutional repositories and resources created or collated elsewhere in the university, such as course material [Rogers (2003)]. She notes the overlapping of such initiatives as digital collections, course web sites, electronic course packs and learning objects, the desirability of integration to search across these repositories and the development of standards to promote interoperability. Rogers also highlights the potential of increased interoperability and connectivity to generate innovation in research, teaching and learning. computing and communication technologies provide new opportunities for the creation, management, storage and dissemination of information. The HEIIAC report was primarily concerned with managing the current problems associated with scholarly communication and publishing, and it stressed the need to adopt a national collaborative approach. As already discussed, a range of players are embracing scholarly communication strategies and arguing that they should be incorporated into a more holistic approach to the management of institutional digital content and intellectual capital. Australian universities have a commitment to support and promote their institutions' research activity through the creation and preservation of digital content, especially institutional repositories and electronic publishing. Australian universities have a commitment to help their institutions achieve their goals more effectively by assisting with the integration of digital resources. These statements reflect the HEIIAC objectives and place them into a framework that, if implemented, would improve institutional and national efficiency and effectiveness. The challenge for HEIIAC was to turn these principles and objectives into action. In June of 2003, the Australian Commonwealth Department of Education, Science and Training issued a call for proposals to "further the discovery, creation, management and dissemination of Australian research information in a digital environment" [DEST (2003a)]. This sought to "fund proposals which help promote Australian research output and help to build the Australian research information infrastructure, through the development of distributed digital repositories and common technical services that manage access and authorisation to these." The application must provide clear evidence of the overall need for the project proposed in terms of the strategic and long-term benefits for the higher education sector in Australia as a whole and identify the specific outcomes that will be derived. The application should indicate relevance to sector-wide needs and priorities and demonstrate that the proposal is an innovative approach. The application must clearly demonstrate that the proposal is a cost effective response to an identified problem and will generate savings or productivity gains through its application. The application should detail the nature and degree of cooperation between collaborating institutions. Where relevant, the application should bear in mind future requirements and outline strategies to sustain the project beyond the period of Commonwealth funding. Institutions should be mindful that in any infrastructure developed under this project the enabling architecture should be both effective and reasonably future proof. These four projects were funded for a combined total of A$12 million over a period of 3 years, with funding commencing at the start of 2004 [HREF11]. The focus of this paper will be the architectural design and creation of software to support the ARROW Project. "The ARROW project (ARROW) will identify and test a software solution or solutions to support best-practice institutional digital repositories comprising e-prints, digital theses and electronic publishing. A wide range of digital content types will be managed in these repositories. The NLA will develop a repository and associated metadata to support independent scholars (those not associated with institutions). A complementary activity of ARROW is the development and testing of national resource discovery services (developed by the NLA) using metadata harvested from the institutional repositories, and the exposing of metadata to provide services via protocols and toolkits. This will include a potential path for the redevelopment of the Australian Digital Theses (ADT) metadata repository incorporated into the NLA’s national resource discovery services. Initially ARROW will be tested in the four partner institutions, prior to it being offered more widely across the higher-education sector. The solution will be open-standards based, or will support open standards, and will facilitate interoperability within and between participating institutions.."
This was (deliberately) a very high-level statement. What might it mean when fleshed out a bit? The best way to get an accurate sense of this is to focus on the content streams that ARROW will manage and the content types it will have to deal with. The functions that ARROW will perform can best be characterised in terms of different content streams. These derive from different origination points within the Australian research community. An e-print repository stores and makes available (in digital form) working papers, pre-prints (not yet published in the traditional literature) and post-prints. E-print repositories have been proliferating in recent years. Most have been set up by universities, but many have also been established by scholarly and professional societies and higher education research centres. Australian universities running e-prints repositories include The Australian National University, Monash University, The University of Melbourne, The University of Queensland, and Queensland University of Technology. The increased activity around e-prints has been facilitated by the development of free, open-source software [HREF12] that manages e-print repositories. A key feature of these repositories is that content is usually available on an open-access basis (anyone can read or view it and no fees are payable). Many e-print repositories also work on a self-submission basis, with researchers depositing material into the repository themselves using an online deposit process. The rationale behind the growing e-prints movement is to reclaim institutional scholarly output and make it widely accessible internationally, thus removing barriers to learning and research, and improving its availability and citation. A digital thesis repository stores and makes available online, in digital form, graduate research output (M.A. by research and Ph.D. theses). Digital theses in these repositories are offered on an open access basis. In Australia the Australian Digital Theses Program [HREF13] is a national collaborative distributed database of digitised theses produced at Australian Universities. Twenty-two higher education institutions are participating members of the Program, which uses deposit-process software [HREF14] first developed at Virginia Polytechnic Institute in the United States of America. A growing number of higher education institutions are trying to establish sustainable publishing alternatives to reclaim the scholarly output currently published in heavily protected commercial journals and monographs. Institutional e-presses aim to offer electronic publishing services and functionality similar to those offered by commercial presses publishing product online, but in a way that is more aligned with institutional objectives, thereby tackling problems associated with the current scholarly publishing climate. These problems include pricing and intellectual property issues, as well as long lead times for publication and publishing models that do not allow for publication of media rich titles. The activities of an e–press can range from digitising material originally designed for print and making it available online, through to the publication (in the sense of making public) material that was born digital and that can only be fully represented digitally. E-presses are more akin to traditional publishing than e-print repositories in that e-press content tends to be offered on a subscription and/or pay-per-view basis. As with e-print repositories, the Australian higher education sector is experiencing significant activity in this area. Both Monash University [HREF46] and The Australian National University [HREF47] have established e-presses, and Royal Melbourne Institute of Technology Publishing [HREF15] has been engaged in electronic publishing for several years now. Each year, Australian universities need to send to DEST information about their research output for the previous year. In most universities, this process involves manual data collection using paper forms which are then keyed into a database or spreadsheet. This is tedious and susceptible to error. In addition, the end result is a largely static document with no way to link from the publication information to the publications themselves. ARROW also wanted to see if it would also be possible to enable universities to enter into an ongoing dialogue with their researchers about the issues associated with academics signing over copyright in research output, and the desirability of deposit into an institutional repository. Of course, not all research takes place in a university. Much also occurs in research institutes of one sort or another, in R&D centres in corporations or even in informal locations (what one might characterise as the Researcher in the Backyard Shed). Researchers at institutions without institutional repositories would find it difficult to make their research visible. As ARROW was seeking to capture and make visible as much Australian research as possible, it would be useful to find a way to deal with this potential content stream. The format is recognized, and the hosting institution is confident it can make bitstreams of this format usable in the future, using whatever combination of techniques (such as migration, emulation, etc.) is appropriate given the context of need. The format is recognized, and the hosting institution will promise to preserve the bitstream as-is, and allow it to be retrieved. The hosting institution will attempt to obtain enough information to enable the format to be upgraded to the 'supported' level. The format is unrecognised, but the hosting institution will undertake to preserve the bitstream as-is and allow it to be retrieved. On the vexed subject of Lossy vs Lossless formats, the decision was made that wherever possible, ARROW would endeavour to store data objects in lossless digital formats (these are formats that do not throw away information when compressing the file). Lossy formats (which do throw away information during compression) might be stored in addition, or rendered on the fly (where possible). Storage in lossy formats would be used only as a last resort. Files with an accompanying DTD or schema preferred. If not, then well-formed XML is acceptable. Validating as XHTML. Content that does not validate will need to be converted. NOTE: The reason for including Microsoft Office file formats is simply a recognition of the market reality. If alternatives (such as StarOffice [HREF39] or OpenOffice [HREF40] become more widely deployed in the target environments for ARROW, these list may well be augmented). All other formats would be unsupported. The final part of the design brief was to make decisions about Open Source and Open Standards. The first decision was an easy one: it was a condition of the funding from DEST that any software developed using project funds had to be made available as open source. This ensured that the Australian (and, ultimately, the global) research communities got the best value from the investment. The second decision also turned out to be an easy one. The core design group agreed that the best approach was to adopt open standards wherever possible when specifying software functionality, data formats or interfaces. Once the project had a clear design brief it was possible to move on to the next step: deciding the broad architecture. This involved a series of iterative steps, as well as a lot of research into what approaches similar projects overseas had adopted. The project ended up defining three categories of required repository functionality. In order to get the content into the common repository, the project needed a way to efficiently manage different classes of content contributors and different content streams. The project ended up deciding to define a series of Content Management and Workflow modules, corresponding to the content streams discussed under section 2.1. Each of these modules would have its own content submission forms and workflow. Each would also have specific functionality to deal with the requirements of that particular stream type. The ePrints module would provide software that offers no less functionality than the eprints.org software used by many universities. The major issue with this module was anticipated to be the management of content self-submission and administrative management. The eTheses module would provide software that offers no less functionality than the current Australian Digital Theses Program software and includes OAI-PMH compliance for metadata harvesting. The main issues were anticipated to be data capture from various sources, efficient harvesting from institutional repositories, identification of software, performance and scalability requirements and interactions with other metadata services. The ePress module would provide software that offers sufficient functionality to run an open-access ejournal electronic press, including both submission management and publishing of multiple journals. The DEST Research Directory module would explore testing of the feasibility and effectiveness of using an ARROW repository to support the annual Department of Education, Science and Training returns. The initial instance will be a repository holding a proportion of the institution's Department of Education, Science and Training 2003 returns. The issues are anticipated to be management of content submission from academics and embedding use of the repository in the existing institution-collection process. The NLA Repository would provide support for non-university researchers by providing a repository hosted at the National Library of Australia. The project also recognised that the ARROW infrastructure would be potentially applicable to a wider range of problems. For this reason the possibility of adding other Content Management and Workflow modules later on was left open. The ability to locate appropriate content for citation purposes is a critical success factor in creating reliable scholarly communication and increasing the impact of research. ARROW decided to develop a nationally available resource discovery service to provide access to Australian research output. The project will establish automated mechanisms for harvesting and re-purposing metadata from institutions and individual researchers. This will be done by applying international standards, specifications and technologies to ensure interoperability. Resource discovery will be supported by descriptive metadata. Other types of metadata may also be generated to support digital rights management, persistent identification, and archiving and preservation to ensure the longevity of scholarly content. In addition, it will be possible to search ARROW repositories through a range of discovery tools (such as education portals or search engines). This exposure will increase awareness of unique Australian content, both nationally and internationally. The project will also seek to expose published Australian research in commercial repositories, such as those created by large journal publishers. The end result of the architectural decisions in each of the categories of Common Repository, Content Management and Workflow and Search & Exposure was a layered architecture. The notion of a layered architecture is not particularly controversial. Such architectures have been preferred since at least the days of the International Standards Organisation Open Systems Interconnect seven-layer reference model for network services. In the Digital Library field these sorts of high-level models are so common that the project group took to referring to 'obligatory' layered architecture diagrams. Figure 1 therefore is the OLAD (Obligatory Layered Architecture Diagram) for ARROW. Figure 1: Obligatory Layered Architecture Diagram for ARROW. Now that the architecture was defined, the project had to work out how to build it. In construction terms, what building materials were available, what were the best ones to choose, and who was going to do the building? As a result of this work, the project rapidly settled on two likely candidates: DSpace and FEDORA. It is being made available under the BSD open source license to other groups to run as-is, or to modify and extend as needed. "For the user: DSpace enables easy remote access and the ability to read and search DSpace items from one location: the World Wide Web. For the contributor: DSpace offers the advantages of digital distribution and long-term preservation for a variety of formats including text, audio, video, images, datasets and more. Authors can store their digital works in collections that are maintained by MIT communities. While DSpace grew out of the needs of MIT, a group of North American and European universities are now participating in the DSpace Federation [HREF18], which will test the existing software, and offer suggestions about how to further develop and improve it. DSpace supports a wide range of content types [HREF19], and particular installations can easily extend the range available. "In the summer of 1999 ... the [University of Virginia] Library's research and development group discovered a paper about Fedora written by Sandra Payette and Carl Lagoze of Cornell's Digital Library Research Group. Fedora was designed on the principle that interoperability and extensibility is best achieved by architecting a clean and modular separation of data, interfaces, and mechanisms (i.e., executable programs). With Cornell's help, the Virginia team installed the research software version of Fedora and began experimenting with some of Virginia's digital collections. Convinced that Fedora was exactly the framework they were seeking, the Virginia team reinterpreted the implementation and developed a prototype that used a relational database backend and a Java servlet that provided the repository access functionality. The prototype provided strong evidence that the Fedora architecture could indeed be the foundation for a practical, scalable digital library system. In September of 2001 The University of Virginia received a grant of $1,000,000 from the Andrew W. Mellon Foundation to enable the Library, in collaboration with Cornell University, to build a sophisticated digital object repository system based on the Flexible Extensible Digital Object and Repository Architecture (Fedora). The Mellon grant was based on the success of the Virginia prototype, and the vision of a new open-source version of Fedora that exploits the latest web technologies. Virginia and Cornell have joined forces to build this robust implementation of the Fedora architecture with a full array of management utilities necessary to support it." [HREF41]. Increasingly, the term FEDORA (which was first used over 5 years ago as an acronym for the architecture) is now being used to refer to this software implementation. In this latter sense, FEDORA is "an open source, digital object repository system using public APIs exposed as web services." [Staples, Wayland and Payette (2003)]. FEDORA can best be thought of as services-mediation infrastructure, rather than an off-the-shelf application. It can use web services to call other services as well as expose its own services using web services standards. Key to the FEDORA architecture (yes, I know this is like referring to an ATM Machine...) is its underlying object-based model. FEDORA stores digital content objects, either as datastreams contained within the repository or as links to external resources. It also stores disseminators, which are ways to render these digital content objects. The software maintains bindings between content objects and their disseminators. Each object has a default disseminator, but may be able to be disseminated in other ways. This architecture is extremely flexible, and provides significant advantages as a platform on which to build other applications. Version 1.2 of FEDORA, released in late December 2003, provides versioning of both objects and their disseminators, as well as a Java-based Administration GUI. There is also a range of other open-source repository projects underway. The Soros Institute is currently maintaining a document which summarises the functionality of many of them [HREF8]. In addition to DSpace, the current version also reviews FEDORA, CDSWare, MyCoRe, i-Tor, eprints.org and ARNO. These each come out of particular responses to the challenges of managing large amounts of digital content, and each have their own strengths and weaknesses. However, it should be said that this is an area where a number of players, both open-source and proprietary, are moving very quickly. DSpace and FEDORA have each announced their plans for version 2.0 of their software, probably due out next year. As a result, ARROW agreed to review its software decision every 12 months. One of the things that the repository may determine is the choice of application development framework. This is because some repositories only allow particular languages to call their Application Programming Interfaces (APIs). The project felt it was important to be able to code in a variety of languages (not be restricted to one). Given the increasing popularity and uptake of Web Services, it was also deemed critical to be able to expose repository functionality in this way. These two points are partially inter-related: having web services makes it much easier to use a range of languages because it decouples the implementation of the functionality from its invocation. ARROW decided that as well as building on web services it would also expose web services. That is, all the new ARROW functionality would also be made available as web services. As discussed above a key driver behind the project was making items in ARROW repositories as accessible as possible. After careful examination of the best ways to do this, the project decided to target three very different technologies. The Open Archives Initiative's Protocol for Metadata Harvesting (OAI-PMH) was created to facilitate discovery of distributed resources, such as those contained in a repository. The OAI-PMH achieves this by providing a simple, yet powerful framework for metadata harvesting. Harvesters can incrementally gather records contained in OAI-PMH repositories and use them to create services covering the content of several repositories. [Van de Sompel, Young and Hickey (2003)]. OAI-PMH is rapidly gathering strength as a way of providing federated resource discovery services and was seen as essential to the success of ARROW. The National Library will use OAI-PMH where available (and other technologies where not) to harvest the metadata from ARROW and other institutional repositories. These metadata will then be used to provide national and international resource discovery for Australian research. This national resource-discovery service [HREF46] will also link with other national services delivered by the National Library for the Australian Digital Theses Program and the international Networked Digital Library of Theses and Dissertations. There is little need to discuss the success of Google. For most unversity students (and probably for most staff!) Google is the resource discovery mechanism of choice. Enabling Google and other search engines to access the metadata and the full text of items in ARROW repositories was an easy choice to make. In practice, this will mean provision of a robots.txt file and publically-available content in a directory location accessible by web spidering software, as well as the ability to automatically request re-spidering for new content. Having the content indexed by search engines is only part of the solution. Given the increasing amount of content searchable on the Web, it is important to ensure that search results are ranked sufficiently highly to be noticed by end-users. The best way to do this varies from search engine to search engine. In addition, there is an active commercial industry focussed around 'optimising' search results. In the case of Google, there is something of an 'arms race' developing between the ranking techniques Google uses and attempts to 'influence' these. ARROW has decided that it does not want to attempt to affect rankings, other than by making our content as accessible (and thus hopefully as citeable) as possible. The third exposure layer was in some ways a less obvious choice. Both OAI-PMH and Google are 'proxy' search services. That is, they collect proxy records and place them in a database where they can be searched. Such proxy systems run the risk of always potentially being out of date (if only slightly). We therefore wanted to make it possible for other search services to connect directly to ARROW repositories and run interactive searches. The standard protocol for such connections in the library world is Z39.50 (More formally known as ISO 23950: "Information Retrieval (Z39.50): Application Service Definition and Protocol Specification") [HREF21]. Z39.50 has not been taken up as quickly as its proponents had hoped (for a variety of reasons too complex to cover here). As a result the Z39.50 Next Generation group (ZNG) have been working on more modern and lightweight protocols to achieve much of the original Z39.50 functionality. These newer protocols are called SRU (Search/Retrieve over URL) [HREF22] and SRW (Search/Retrieve for Web Services) [HREF23]. ARROW decided to support both SRU and SRW connections to make it possible for real-time searching through things like the portlet technology being developed by education.au (HREF24). In addition to these three technologies, the project is also looking at ways of providing an alerting service. The obvious technology to support this is RSS [HREF48]. Of course, there is little point in setting up such a facility until there is (i) a sufficient base level of content and (ii) a sufficiently steady flow of new content. The project will accordingly wait until that stage before providing an RSS-based alerting mechanism. The other major decision to be made was how ARROW would develop the new software. The original bid to DEST had envisaged that the project would hire its own software developers to write the necessary software (a DIY strategy). The new project manager realised that a potentially far better option would be to hire a builder, preferably one with experience with our preferred building materials. After a good deal of exploration and negotiation, the project announced [HREF49] in July that it was partnering with VTLS [HREF50] who already had a product on the market called VITAL [HREF51] that was built on top of FEDORA. ARROW has licensed VITAL 1.0 (which is primarily aimed at digital image collections) and will be working with VTLS to extend the functionality of FEDORA either by contributing back to the core FEDORA code or by writing a series of ARROW-commissioned modules. This will all be open-sourced using the same license as the FEDORA code. These ARROW-commissioned modules will call FEDORA using the existing APIs and will also expose themselves as a series of Web-Services. VTLS will be able to build products on top of these new ARROW-commissioned modules if they wish and future releases of the VITAL product will almost certainly use these modules. But because the new ARROW modules will be open-sourced, in the same way anyone else will be able to build on top of them to do whatever they want. To really stretch the construction analogy, we are hiring a builder not just to build us a house, but also to provide building materials to anyone else for free. The project is on track to have functional software available by the end of 2004. This would be the Open House date, and from that point onwards the ARROW Partners will be loading content and providing a semi-production service. Initially this service will only be available at the four project partner institutions. There is an allocation in the budget in year 3 (2006) to roll out the ARROW initiative to up to 10 other institutions across Australia. It may be possible to start this phase earlier if all goes well, but it is not possible to commit to this at such an early stage. The initial round of DEST funding runs out at the end of 2006. One of the DEST requirements was that successful projects should address the issues of sustainability. Both DEST and ARROW are keen to see the initiative continue beyond the end of 2006 and are thinking hard about how to ensure long-term viability for the project (assuming it is successful). It is far too early to say what these plans might be, but one idea that we keep playing with can be summarised as 'Embedding ARROW into the things that universities have to do anyway'. The process of developing the architecture for ARROW has been a constant interaction between the evolving vision for what the project wanted to do and what the software might make possible. Sometimes the software possibilities constrained the vision. Sometimes they expanded it. But the end result should be a flexible architecture that will enable the project to meet the DEST requirements to make Australian research more visible. And, who knows, ARROW may end up becoming something more. In less-guarded moments the ARROW Project Team like to talk about ARROW becoming part of the fundamental infrastructure of higher-education in Australia. Perhaps it will, but there is a lot of work to be done first, and the first challenge is to succeed with the initial (and quite daunting enough) list of deliverables. The architectural and design work described in this paper is just the first step towards what will hopefully be not just a single house, but a thriving community. The ARROW Project is sponsored as part of the Commonwealth Government's Backing Australia's Ability [HREF42]. House of Commons Science and Technology Committee (2004), Scientific Publications: free for all? (HC 399-1), UK Government Stationery Office, July 2004. [HREF45].